6. Is SNAP® the appropriate program for your community? 7. What types of organizations are best suited to implementing SNAP®? Public Safety Canada's National Crime Prevention Centre (NCPC) has a mandate to develop and disseminate knowledge of effective crime prevention programs to help decision makers and practitioners in communities across the country make the best use of their crime prevention resources. To achieve this mandate, the NCPC supports selected, evidence-based crime prevention projects in communities across Canada and seeks to provide practical answers to three key questions: what works (with whom and in what circumstances), at what cost, and how. Identifying what works is achieved through selectively evaluating carefully chosen crime prevention projects. Establishing the costs and cost-benefits is done through cost-benefit analyses. And unpacking the 'how' is done through collecting and analyzing qualitative information from all organizations NCPC supports to implement interventions. 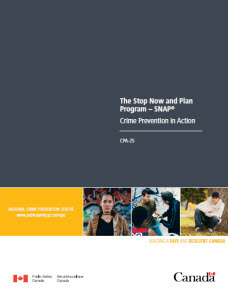 This Crime Prevention in Action publication provides information on Stop Now and Plan (SNAP®) and the SNAP® projects NCPC is supporting in various locations across Canada. It addresses implementation issues to be considered by those interested in implementing a SNAP® program. In particular, it considers the following questions: When is SNAP® appropriate? What are some key characteristics of organizations most suited to implementing SNAP®? How are participants successfully recruited? And, what are the key partnerships that will foster the success of SNAP®? What is Evidence-Based Crime Prevention? Chronic offenders do not appear suddenly in the criminal justice system. They have a history and pathway that can often be traced back to various identifiable risk factors in their lives, as well as missed opportunities to change these pathways. Studies, conducted in various countries, demonstrate that pathways to chronic offending can be traced back to ages 7–8, when young persons, especially boys, begin demonstrating risk factors associated with crime. These factors have been well documented both internationally and in Canada and include, for example early aggressiveness, poor peer relations and early substance use. Pathways to a life of crime are not inevitable. Many of the risk factors can be changed if focused interventions are delivered to the right persons at opportune points in their lives. When opportunities to intervene are missed, the costs and difficulties of responding effectively increase. Evidence-based crime prevention rests on intervention principles and methods established through research to address risk factors known to be associated with offending behaviour among those who are at risk. Implementing this approach can result in reductions over time in offending and victimization and their associated costs, and increase community safety. The Stop Now and Plan Program (SNAP®) is an evidence-based, award-winning crime prevention model program developed in Canada by the Child Development Institute (CDI). Since its inception over thirty years ago, SNAP® has helped children, youth and their families learn self-control and problem-solving skills along with strategies to manage their emotions. SNAP® participants learn to calm down and reflect before reacting and to seek out positive solutions to their problems related to antisocial and violent behaviours. A license from the CDI is required to implement the SNAP® model and significant training and technical assistance is provided by the CDI SNAP® team. Discussions with the CDI team can assist interested organizations in determining if a SNAP® program is appropriate for their community. NCPC is contributing to the growth of the evidence about SNAP® through evaluation of the projects it supports. The contribution of the evaluation of NCPC SNAP® projects is significant. It will be the first time SNAP® has been rigorously evaluated in remote, Aboriginal communities. Knowledge will be built about SNAP® delivery in non-clinical settings with projects that do not necessarily have a research-based context. Lessons learned about differences in implementation based on the region, language, logistics and complements of staff will be documented and shared. Information on the interim results of the evaluation is available at Public Safety Canada. In terms of cost effectiveness, the interim results from the NCPC project evaluation show that at the Edmonton SNAP® site, for every $1 dollar spent on producing a change in a young person's competencies over a 3–6 month treatment period, $4 dollars is saved per year. “…SNAP® gave us some skills to recognize a problem that could boil over. So, whenever there is potential for a fight, we recognize the signs and talk it out calmly.” Parent of a SNAP® participant. Public Safety Canada, National Crime Prevention Centre (NCPC) has supported nine SNAP® pilot projects across Canada. The map and table below provide information on the location and projects being implemented. The first step in all SNAP® programs is an in-depth assessment to clearly understand specific risks for the children and families being referred to the program. One of the criteria for admission to the program is involvement in antisocial and/or delinquent behaviour. Children admitted to SNAP® typically fall within the top two percent of children exhibiting aggressive and delinquent behaviour, such as bullying, rule-breaking, and conduct problems. When a child becomes part of a SNAP® program, a plan is developed with the child and family. The plan includes SNAP® core and supporting program components that are best suited to addressing the issues related to antisocial and violent behaviours. The SNAP® Children's Club (Boy's or Girl's Club), which uses interactive activities to teach and practice impulse control, anger management and decision-making skills. The Club usually lasts for 12 weeks and provides 18 hours of programming. The activities are gender-specific to meet the unique learning needs of boys and girls. The SNAP® Parent's Program, which operates at the same time as the children are participating in the Clubs. In this program, parents are kept informed about what their children are doing in the Clubs and how to reinforce what is being learned when at home and in day-to-day life settings. Parents also have the opportunity to talk about challenges they face as parents and receive practical and effective tips and ideas for addressing these challenges. The SNAP® children's and parent's programs are designed to support each other. Depending on the individual plan or the specific risks in a child's life, additional supporting SNAP® components are also offered such as individual befriending, school advocacy and teacher consultation, child behaviour management support and counseling. SNAP® for Schools is designed for elementary school-aged children and uses a whole school approach to keep children in school and out of trouble. Participants are children who teachers identify as struggling in the school environment and who display disruptive behaviours that interfere with learning. As part of the whole school approach, selected school personnel are trained and then work alongside the classroom teachers to provide 12 weekly 40-minute SNAP® sessions. Similar to the SNAP® program for Boys and Girls, the school based group sessions use interactive techniques to teach and practice impulse control, anger management and decision-making skills. As follow-up to these sessions, the classroom teacher is trained to continue using the SNAP® principles learned by applying them in real life, day-to-day situations. The classroom teacher is also provided with training and support to conduct weekly, 20 minute classroom based SNAP® review sessions. If required, other school personnel or community professionals are also involved in providing SNAP® coaching sessions with individual children. The SNAP® for Schools – Mental Health model is designed to ensure that, in addition to receiving the standard SNAP® for schools curriculum, a multi-faceted treatment plan for children with mental health concerns is in place. This includes referrals to mental health workers, psychiatrists, psychologists, and pediatricians to address diagnoses, medication issues and treatment planning for children and youth who are participants. The SNAP® Youth Leadership Services is for youth (12–17) and can be delivered in both schools and community agencies. The youth who participate have previous involvement with the SNAP® Boys/SNAP® Girls or SNAP® for Schools program and require further preventative skill development in order to avoid more clinical interventions and/or future police contact. The objectives of the program are to improve participants' quality of life through providing opportunities for the youth, encouraging them to attend school regularly and to stay out of trouble with police and other authorities. There are three main components of the program. Individual counseling/mentoring – where youth are provided with individual support to improve relationships with adults and peers, reinforce and enhance SNAP® skills, and identify goals and plans to attain them. The SNAP® Boys/Girls Leadership Club, where youth are involved in weekly, 2.5 hour group sessions during the school year. Activities are designed to address the challenges youth experience at home, school and in the community and include adults with whom the youth can build strong, helpful alliances. An employment continuum where participants from the SNAP® Leadership Clubs have the opportunity to work in the SNAP® summer camp program as Leaders-In-Training. Additional supports including parental support, school advocacy and teacher support are arranged as required and family counseling, parent/caregiver workshops, crisis intervention, victim restitution, and homework club/academic tutoring are also available. Is SNAP® the appropriate program for your community? The National Crime Prevention Centre recommends a thorough analysis of the local situation in any given community prior to deciding what crime prevention program to implement (for more information: Guide to Select Promising and Model Crime Prevention Programs). A portrait of the local situation provides a clear overview of the population, emerging risk behaviours or problem situations, risk factors and the context in which they occur. This assessment helps illuminate what seems to influence people to make the decisions to adopt risky behaviours. The portrait also requires an inventory of organizations, resources and programs in the community and through discussions among community members and service providers, begins to build the shared understandings of issues and gaps in the community that can lead to strong partnerships. Based on a comprehensive portrait of the local situation, the crime prevention programs that are the best fit with the people and behaviours of concern and with the strengths of the community can be identified. For example, if the analysis of the community determines that children under the age of 12 are exhibiting behaviours that are troublesome and that there are gaps in terms of services available for those children and their families, a SNAP® program might be worth further investigation. For 45 years, Uncles & Aunts at Large has offered struggling single-parent families in Edmonton, Alberta positive activities for their children. But staff were noticing increasing levels of aggression and delinquent behaviour in children and the research linking young children's aggressive or anti-social behaviour with potential future criminal involvement added to their concerns. The issues staff were experiencing were beyond the scope of the current programs and it was clear that the organization needed to find other ways to help the families. Uncles & Aunts at Large explored what programs and services already existed and discovered there was a gap in prevention programs for children with overt behaviour issues. They learned that SNAP® is specifically designed for young children with higher levels of these types of issues and that there was substantial evidence showing positive, long-term behaviour change from the program. CDI was contacted and the SNAP® Team discussed the details and requirements for a program with the staff at Uncles & Aunts at Large and their partners. It was determined that the SNAP® approach was appropriate for the community and the organization. Results in Edmonton have been positive. According to parent interviews and extensive parent/teacher data gathered over the three-year SNAP® history, SNAP® has made the lives of those involved better. Perhaps the best indicator of SNAP®'s success is that almost all these very busy families choose to complete the 12-week program. In the first three years of the pilot phase, 96 children and their parents or guardians have graduated. During that time, only six children left the program, resulting in an impressive 94% program completion rate. What types of organizations are best suited to implement SNAP®? While SNAP® is most often delivered in schools, it is usually administrated by a community organization in partnership with schools. Organizations that have some experience delivering clinical programming, such as accredited children's mental health facilities, seem to be well suited to implement SNAP®. Organizations that are not accredited or experienced in clinical approaches can also successfully deliver the SNAP® program. Modified versions of certain assessment tools are used and personalized training is provided by the Child Development Institute. Implementing SNAP® requires teams of staff, including Program Managers, Family Workers, Children's Group Leaders and Researchers. Staff are involved in a variety of work such as assessments, facilitating groups and classroom activities, working one on one with participants and families, meeting with school staff, police, child welfare and other partners, record keeping, marketing and evaluation. Hiring the appropriate staff is critical to the success of the program. The most relevant combinations of education, experience and personality traits required vary depending on the team being created. Selecting a good complement of staff and providing training and support for them will make all the difference in the implementation and success of the program. A robust youth referral and assessment process is crucial to the effectiveness of SNAP® projects. The process helps identify which children and families are the most likely to benefit and succeed through participating in the project. Referrals come from a variety of sources that make sense for different community contexts, but one of the distinguishing characteristics of the SNAP® program are the Police-Community Referral Protocols. These Protocols lay out the processes for referring people to SNAP® and also provide a mechanism for solid partnerships between police services, social services, community, mental health agencies and young people themselves. This component of partnering with the Police enriches the experience for SNAP® participants. It puts into context how impulsive or aggressive behaviours can result in Police contact and how personal choices can lead to conflicts with the law. It also provides an opportunity for the children to learn their rights first-hand from a neutral, but authoritative source. SNAP® requires a comprehensive, psychosocial risk assessment specifically designed for young children with significant behaviour problems. It is often one of the first times these children and their families begin to understand the issues underlying the difficult behaviours they have been struggling with. It is very important to make sure the children and youth who participate in the program are the ones it was designed for and who will benefit the most from it. Assessment information is gathered and shared among people in different systems who are concerned about the children and youth. Often it is complex to coordinate all the people with this information and come to agreements on who are the most appropriate participants. When referral partners have a clear and ongoing understanding of the SNAP® mandate, role, and parameters, and when referral processes are efficient yet robust enough to yield consensus, effective referrals are increased. Over time, engaging students who “graduate” from SNAP® in delivering the program is powerful. I was getting ready to start a SNAP® session in my grade six class, when a previous SNAP® student who is in grade seven came by the classroom. When asked if he would like to join the class for SNAP®, he responded with a very excited “YES”! Since joining the class, the level of enthusiasm and motivation among the younger students has greatly improved. Now we have several previous SNAP® students volunteering to work with primary students to help resolve conflict in the school yard. They are called the SNAP® Squad! (SNAP® Program Staff). The SNAP® Program thrives in communities with strong partnerships amongst schools, community, child welfare and mental health organizations as well as police, justice and corrections sectors. The issues faced by children and families are complex and often require the combined efforts of many service providers to find resolution. It is important for organizations to demonstrate that their SNAP® project is effective and efficient to increase the likelihood that it will be sustained in the longer term. Engaging partners and building sustainability are mutually reinforcing. Building and nurturing strong and relevant partnerships leads to higher levels of community engagement, and in turn, this increases the chances of success for shifting existing resources and investing new resources in ongoing support of the SNAP® program. Partnerships develop differently depending on their purposes. Sometimes partners are providing support by sharing information or awareness about each others' programs and services. On the other hand, sometimes partners are integral to each others' program and service delivery and concrete agreements need to be established to guide the ongoing partnership. One example of this is the partnerships between police services and those running SNAP®. The charts below demonstrate the importance of partnerships in the delivery of SNAP® programs. They show the experience of the Public Safety Canada, NCPC SNAP® projects with respect to the sectors partnered with and the types of contributions made. Based on the partners identified by each sponsoring organization through their bi-annual performance monitoring reports, the following chart represents a compilation of all the partnerships for the projects which is then categorized by partnership sector type. For the NCPC SNAP® projects taken as a whole, close to 30% of all partnerships were with organizations from the education sector with an additional 30% coming from the community, social or voluntary sectors. *The proportion of 'Education' partnerships may be over-represented based on the nature of the SNAP® for Schools program – collaboration with schools and school boards is a requirement of the program. ** 'Government' refers to partnerships with local/municipal governments, provincial/territorial governments and the federal government. ***'Professional Associations' refers to one partnership with the Alberta Teachers' Association. Based on the type of contributions made by partners, along with information identified by each sponsoring organization in their bi-annual performance reports, the following chart represents a compilation of all the individual partner contributions for the projects categorized by contribution type, which is then separated by partnership sector. For the education, criminal justice, government and community-based organizations or services sectors, between 30% and 40% of the partners contributed by making referrals to the SNAP® program. For the health/mental health sector, 35% of the partners contributed by accepting referrals from the SNAP® program. Finally, for Aboriginal agencies or organizations, 40% of the partners provided in-kind contributions and another 40% contributed to the SNAP® program through participation on an advisory or steering committee. * 'Criminal Justice' refers to partnerships with the police, justice and corrections sectors. ** 'Community-Based Organizations or Services' refers to partnerships with community, social or volunteer services, community coalitions or networks, service clubs and professional associations. SNAP® offers well researched cognitive-behavioural programs with strong technical support for implementation from the Child Development Institute. This Canadian program is being delivered and tested in countries around the world and is demonstrating positive results in helping children reduce aggressive conduct and other problem behaviours that are risk factors for criminal involvement. As a result, these children and youth at-risk are decreasing the likelihood of their future contact with police and the criminal justice system. Through the SNAP® projects that the National Crime Prevention Centre is supporting, Public Safety Canada is helping to build the evidence about how SNAP® works in community-based, non-clinical settings. For the first time, valuable information on how the SNAP® program works in an Aboriginal context will be documented. As the knowledge these projects are developing becomes available, it will be documented and shared widely with practitioners, policy makers and other decision-makers to help determine the best use of crime prevention resources for communities in Canada. Have a look at the SNAP® website. Contact the CDI SNAP® team at: ccco@childdevelopment.ca. Have a look at the Public Safety Canada website in the crime prevention pages for more information on SNAP® and other model and promising crime prevention programs. Contact the organizations Public Safety Canada, NCPC supports and talk with them about their experiences (see websites in table 1 of this document). For more information or to receive a copy of the final evaluation report, please contact the National Crime Prevention Centre	by e-mail at ps.prevention-prevention.sp@canada.ca. If you wish to register for the NCPC mailing list to receive information from the Centre, please visit the subscription page.